Bulkhead mounted, adjustable height footrest with folding tread. Foot actuated lever allows simple and easy adjustment up and down to fit any sized occupant. Designed for use with seats without integrated footrests. The SHOXS Adjustable Height Footrest is probably one of the coolest and most useful seat accessories we've ever invented. Made from 5086 and 6061 Aluminum alloys, 316 Stainless Steel hardware and Composite bushings, the footrest is 100% marinized and ready for anything you can throw at it. An extra wide tread makes the footrest extra comfortable for long transits. The tread folds away to allow for unobstructed passage in front of the seat. A foot actuated lever installed center-line on the tread allows the user to move the footrest up and down, no tools required. When seated on a boat at a standing line of sight, a footrest is an absolute necessity. 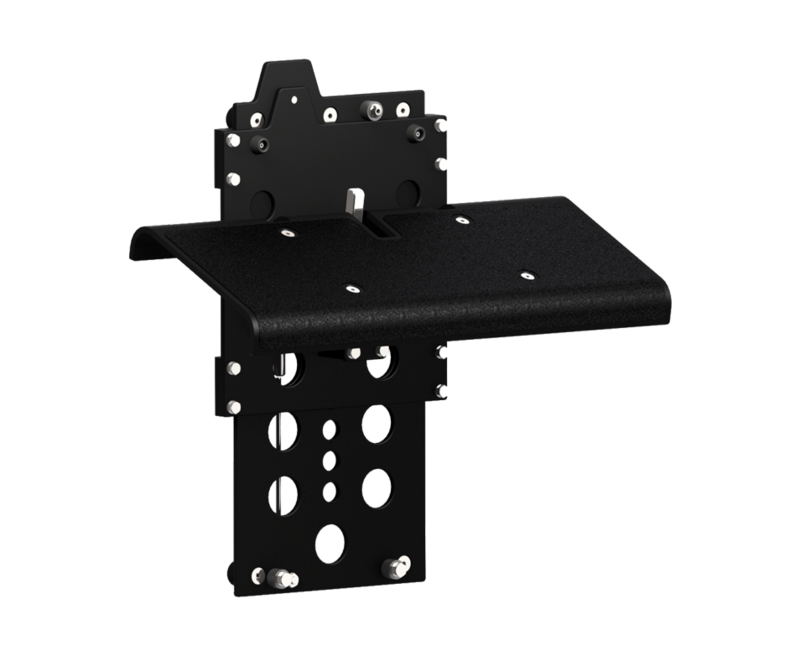 Being able to adjust the height of the footrest ensures that all sized users get the benefit of a secure foothold while the boat is underway. The footrest is a great compliment to any SHOXS Seat that does not have a built in footrest. Custom tread width and tread angles are available. Check out the Interactive 3D Model to see the footrest in action.